He’s been writing since he was six and there’s nothing else he would rather do, says this determined young author. EVERYBODY loves a good secret. Whether it’s a trivial matter such as a secret crush or something grand like an international conspiracy, people often get a kick out of discovering the unrevealed. With this in mind, author Malcolm Mejin decided to play on the themes of secrets and revelations in his debut novel, Cool Diary. “Secrets and revelations sound like good ingredients in a book to me. As human beings, we have a tendency to be very curious and I think revelations can actually teach us real-life lessons,” says Kuching-born Mejin. The habit of keeping journals played a part in inspiring the 25-year-old to write Cool Diary, which is an epistolary novel. Sharing secrets: Malcolm Mejin decided to play on the themes of secrets and revelations in his debut novel, Cool Diary. “I pretty much grew up writing journals. I actually have a huge box where all my diaries are safely kept. So I thought it would be a great idea to write a novel that feels as though you’re reading about somebody’s life story, just like a journal,” reveals Mejin. 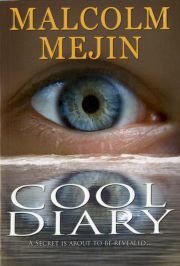 In Cool Diary, Mejin weaves a story about Cool, a special student who leads a secret life in the human world. However, being extraordinary does not spare him from the ordinary problems that every teenager faces even as he grapples with an impending apocalypse. “On the outside, Cool looks just like any other normal person. The only thing that separates him from the others is his special abilities. He is sworn to secrecy, but there are times when he’s on the brink of revealing who he really is,” says Mejin. It was a conscious decision on Mejin’s part to christen the book’s titular character with a bizarre name. “When I first started writing the book, the main character’s name was actually Mart, which is short for Martin. But eventually it all boiled down to the title of the book and I wanted the name to sound simple and catchy. “So I thought to myself, ‘What would sound cool for a book title?’ and then bam! The word ‘cool’ just rang inside my head,” the Sarawakian shares. It took Mejin about three months to complete Cool Diary. 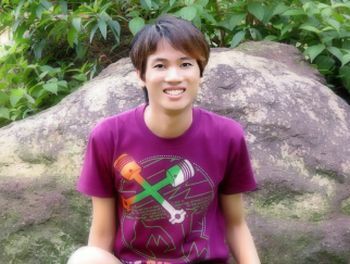 While the book may be his debut novel, Mejin is not exactly an amateur in the publishing industry. The journalism graduate from Universiti Tunku Abdul Rahman has been writing story drafts since he was six and compiling them into books for himself. His short story, Women In Boots, was shortlisted in the MPH Search for Young Writers competition and appears in the 2005 collection, Rewind, Fast Forward: An Anthology. Apart from that, Meijin also created the children’s book series, Zany Zombie, which began publication in 2010. “I have been writing my whole life and working on Cool Diary feels like a dream come true,” Mejin offers. Running through the young author’s list of published work, it’s apparent that his readers fall within the children and young adult demographics. “Well, I guess the reason why I decide to write for young people is because I’m young myself. Besides, there are countless interesting stories and anecdotes during school and college life just waiting to be told,” says Mejin who lists Charles Dickens, Suzanne Collins and R.L. Stine as some his favourite authors. Having experienced first hand the tough journey of getting a book published, Mejin believes more can be done to develop the local literary scene. “There’s just not enough spotlight on the Malaysian literary scene. I think Western books are given more emphasis as there is a persistent sentiment that fiction novels from abroad are much better than the local ones. “But what people don’t realise is that local books can be just as good as those written by Western authors. The time has come for our local authors to stand out,” Mejinsays. That being said, the author is optimistic about the future of the publishing industry here. “I’m an idealist, so I’d say that the local literary scene is going to be amazing in the next 10 years. But for us to get there, we will need continuous support from literary institutions, the media and the public. Once the awareness is there, people will start to notice and gradually embrace local authors,” he feels. But regardless of what state the local literary scene is in, Mejin is certain he will keep writing in the future.